We take you immediately to the F.F.B. Football Field inside Capital City, Belmopan where the Belize National Male Football Team hosted its counterparts from St. Vincent and the Grenadines Friday in match 5 of this round of the FIFA World Cup Brazil Qualifiers. Of course you wouldn’t have known it was an international outing from the minimal fan attendance and even inside the media booth we were the only broadcasters. 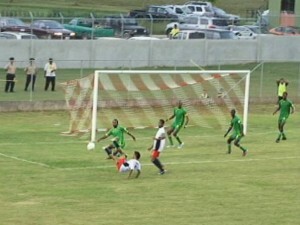 It remains obvious the Belizeans abandoned the team after that ugly 4-1 loss to Grenada last month. Still life goes on and we’re 10 minutes in when Myron Samuel beat Ian Gaynair with this cheeky heel play then deals to Shandel Samuel who past Dalton Eiley and Vallan Symm. Woodrow West who replaced the injured Shane Orio in times rush out the goal—Samuel pats to Cornelius Stewart who scores into an empty goal to give St. Vincent a quick 1-zip lead. 10 minutes later, Elroy Smith who had a good outing picks out Deon McCauley with this long distance delivery; he beats goalkeeper Dwayne Sandy rather easily then smacks it into an empty goal to tie the score at 1 apiece. Incidentally folks, Deon McCauley becomes the highest scorer in these world cup qualifiers having tallied 9 goals. That’s worldwide and that’s big. McCauley now has the most international goals scored for Belize with 13. Team Belize gets the chance to grab the lead when McCauley finds Kafu Roches with this highball. 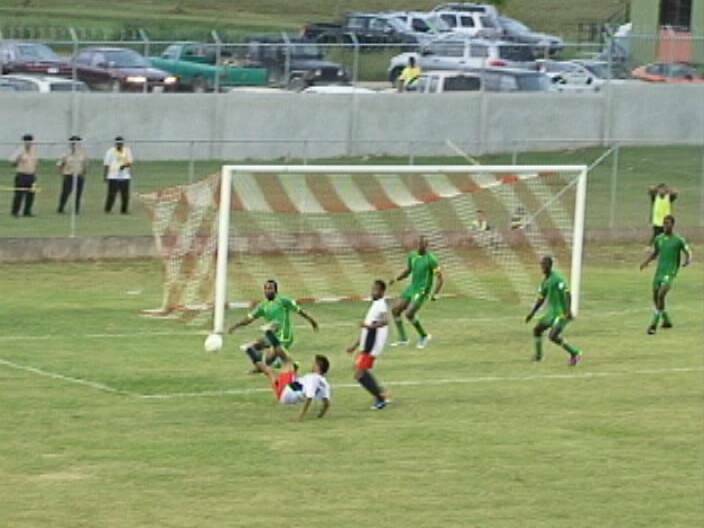 In heavy traffic, Belize’s 1 international player controls to have a look at an empty goal. Unfortunately the ship into the net raises over the crossbar and we’re certain he would want that one back. So we go to 2nd half and this vicious launch by Elroy Smith beats Dwayne Sandy but Smith is denied by the goalkeeper’s best friend—the crossbar. Folks our team dominates the action now and Smith splits 2 defenders to fire this low cruise missile that nicks outside the far upright. Fresh off the bench, Daniel Jimenez tries to hook up with Smith on this press but Sandy read and intervenes. It’s getting late and Belize needs a goal to post the W and super striker McCauley gets the chance to deliver but he comes up with a high riser. Harrison Roches then finds Deon McCauley with this touch but the off balance shot fails to hit the target. McCauley has another chance to give Belize the W when he tries to redirect this shot from Jimenez but it sails over the horizontal bar. McCauley then turns provider as he whips this ball across the face of goal, it’s kept alive by Roches to Jimenez who opts for the spectacular and fails miserably. Belize settles for a 1-1 tie in a ballgame we should have won. 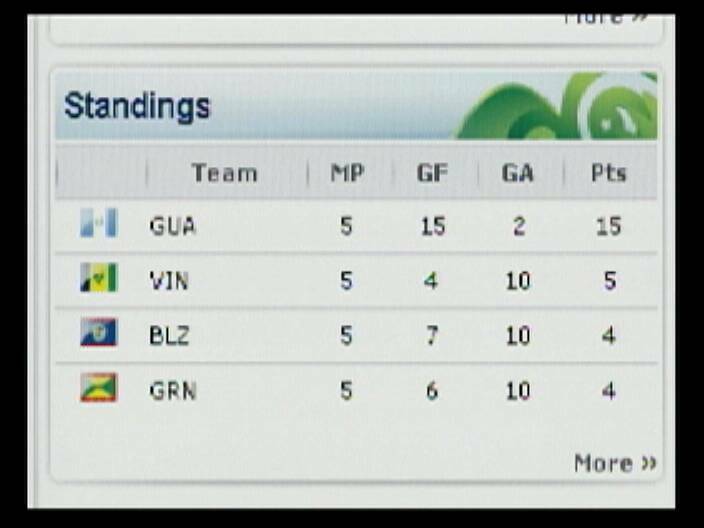 Out at Grenada, the Guatemalan team come up with 3-zip win to now show a perfect 15 points from 5 outings and are assured of moving on. 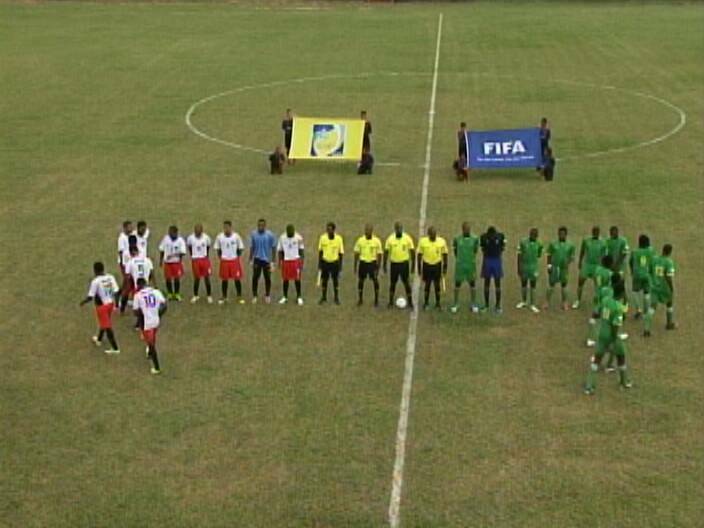 With the draw, St. Vincent moves to 2nd place with 5 points, Belize and Grenada both show 4 points apiece but Belize has a better goal differential. 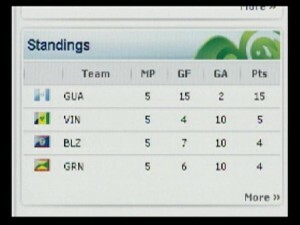 Our team can still finish in 2 place if they win tomorrow’s match against St. Vincent. The team left for St. Vincent on Saturday and we wish them well. In volleyball news, the national volleyball championship was staged at the UB Gymnasium in Belmopan over the weekend with 8 male teams and 5 female teams participating. 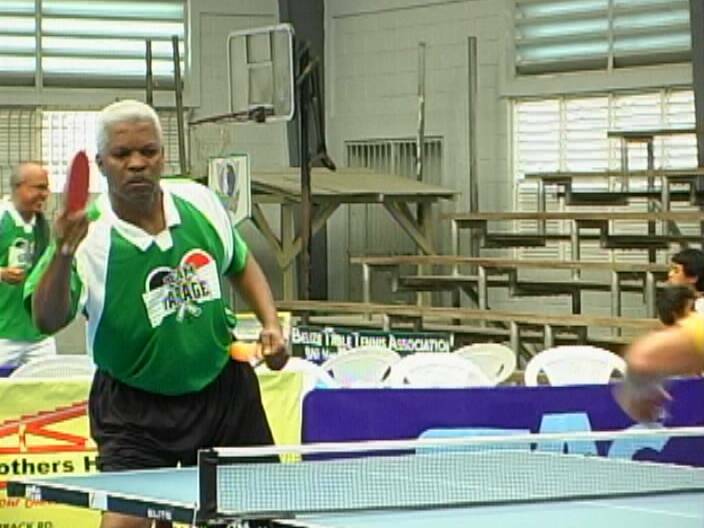 This is the monster match-up between defending champion scorpions of Belize and Dangriga—it’s a long rally until Ernest Broaster takes charge with this cruel smash as Scorpions only needed 2 sets to get past Dangriga 27-25, 25-19. Scorpions then went on to the finals where they defeated Orange Walk 25-19, 27-25, 25-13 to claim the title. In the female side, Lady Jaguars smashed Moen Stars 25-22, 25-12 to claim that title. We say congratulations. 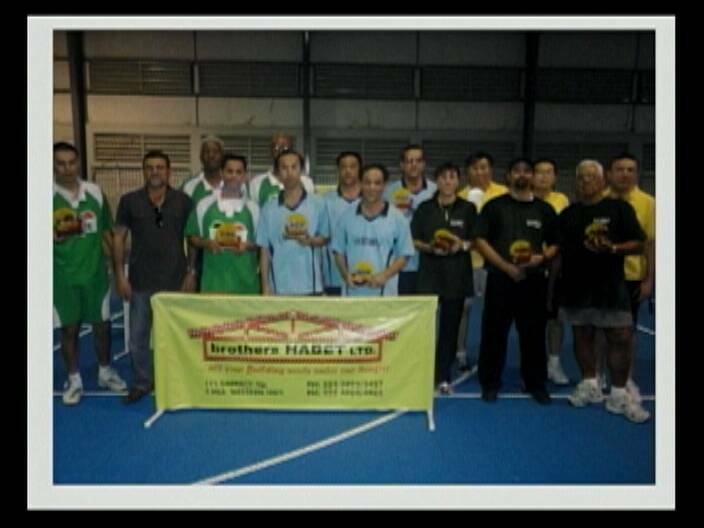 Turning to the table tennis scene, yesterday, Garage #1 blew past hurricane to win the 1st place title in the 2011 Brothers Habet Team League. Rivero Welders then got past racqueteers to grab 3rd place. In the 2nd division play, Garage # 2 defeated Talawah to claim the title while Fantastic 4 up ended terminators to finish 3rd. In the SJC Inauguration Tournament held on Saturday, Yasser Musa, John Lee and Aaron Stock finished 1st, 2nd and 3rd respectively in the advance class. Jason Chan won the intermediate class with Mishek Musa and Gavin Wong finishing 2nd and 3rd in that order. While Joshua Parham took the beginners class with Nick Chang 2nd and Zalen Miles 3rd. 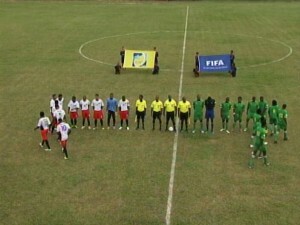 a total of 59 young players participated in this tournament. In cycling news, here’s a reminder that the 7th Annual Sagitun Banana Classic is set for November 27th 2011 and it brings with it over $15,000 in prizes. For certain you won’t want to miss it folks. We also want to inform you that the 4th Camalote Cycling Club Race which travels from Western Gas Station in Raring Creek to Dangriga is set for this Saturday 19th November. Meanwhile, amateur boxing comes alive at San Pedro this Friday night as King of Kings Production presents a 7 bout card out at the island. 4 boxers from the island and 3 from Leopold Smart’s Bocing Gym will take on a contingent from Mexico. Finally folks the 5th Integrity Annual Sports Fest gets off this Saturday 8:30 a.m. at Big Bird’s Isle. Why did Orlando Jimenez better known as”Leech” withdrew from the National Team. 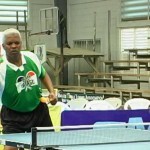 Its because he is Ignorant, he thinks he is the best baller, or because of his age.